A new model of the inner Solar System's early history suggests Mars and Mercury are the leftovers of a giant ring of debris that created Earth and Venus (National Geographic via Slashdot). At the moment, conventional wisdom holds that a disc of material circling the Sun coalesced into the four inner planets. 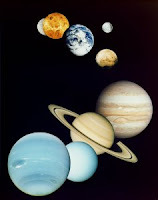 The problem with that is, each planet should be the same size and following a similar orbit. But they're not. Mercury and Mars are much smaller, and follow more elliptical orbits than Earth and Venus. To solve this problem, University of California astronomer Brad Hansen suggests the early Solar System was composed of rings of material, not a disc. One of the largest rings eventually created Earth and Venus, which kicked out the left over matter. That matter joined up with smaller rings, the theory goes, to create Mercury and Mars.